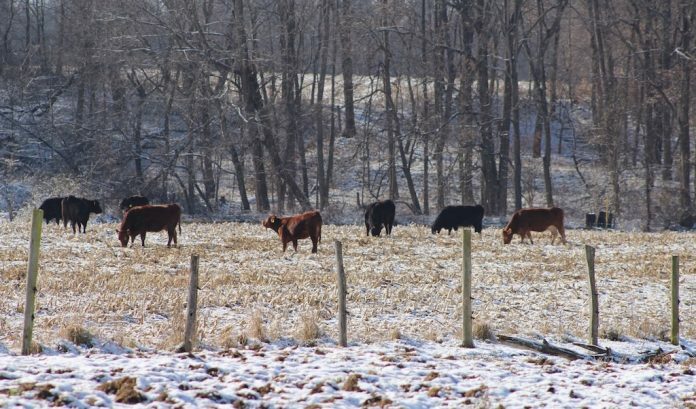 Winter weather conditions often present challenges to cattle managers across the Midwest. Although we can’t alter the weather, there are management steps that can be taken to help maintain cattle health and performance. Here are some things you can do to help keep your cattle warm and healthy. Feeders should consider bedding sooner rather than later when extreme cold weather is expected. Waiting until cattle are exhausted before providing bedding results in calves simply “resting up” on the bed pack instead of maintaining dietary intake. This could result in diminished performance and increase the risk of digestive upset when cattle resume eating. In extreme cold conditions, the priority pens for bedding should be the lightest calves (<750 pounds) and cattle that are within 45 days of being shipped. The lightest cattle would lose the most body heat to the environment and are likely at the greatest risk for sickness and death loss. Bedding the almost finished cattle helps avoid negative impacts on carcass quality and can also reduce the chances for injury or mobility problems late in the feeding period caused by cold or icy conditions. Cattle that are not in the lightest group and not expected to finish until late winter or spring have time to compensate for any performance losses they might experience due to cold conditions. Keeping feed intake consistent is a challenge during extreme weather conditions. Some days keeping machinery running simply to get the cattle fed on time is a major accomplishment. Inconsistencies in feed intake lead to poorer conversions and in extreme cases, acidosis. Adding additional roughage to a finishing diet (feeding 12-13 percent instead of 10 percent roughage, for instance) could reduce the impacts of any inconsistencies in feed consumption. Backgrounding cattle are usually fed to achieve a certain ADG target. Extended periods of cold conditions can cause cattle to fall short, especially if the cold temperatures last for an extended period of time. Increasing the energy content by another 2 to 4 Mcal NEg or increasing the amount fed by an additional 0.2 percent of body weight might be required to meet production targets. Keep in mind that today’s snow can easily become tomorrow’s mud. Muddy conditions in the feedlot can be one of the biggest issues in getting cattle to perform during the winter and early spring. Anecdotal evidence suggests that muddy yards can result in as much as a 100 pounds difference in final weight between cattle of similar genetic type that were fed similar rations. Removing snow and scraping outside pens can be incredibly difficult to accomplish, especially during extreme weather conditions. However, anything that can be done to remove snow and improve lot conditions now will pay off later as the lot surface starts to thaw.